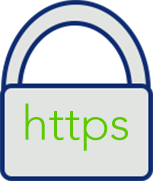 The ‘s’ in https:// stands for SECURITY and provides an encrypted security environment between a browser and a website with a valid security certificate installed. HTTPS provides additional encrypted security for sensitive information like credit card details or contact information – name, email address etc. If you collect email addresses for newsletters or subscription forms, then we highly recommend installing a secure certificate on your hosting server. How do we view a secure certificate on a website? Look at the web address at the top of this page – You will see a padlock next to https which means this page is secure. Click on the padlock for further information and a popup displays your connection to this site is private. If you have a secure up-to-date certificate on your website your organic listings will perform better – More Traffic! Your customer information will be encrypted and protected from snoopers, thieves and dishonest middle-men. You also make it harder for hackers to enter your site. Customer confidence increases – especially when credit card information or personal emails are used. This will have a positive effect on sales. Status – You are a serious business owner and treat security as priority for your online business. Visitors value security and will return. You can either do this yourself or get your webmaster or whoever deals with your site administration to install a certificate. In some cases there will be additional costs. Access to 5 free email accounts.